Maya Brodkey, a leader in Glitter Kehilla, thinks of herself as Glitter’s protective Jewish mom, and of Glitter as an aged-based group “radically welcoming and deeply grounded in Jewish values and traditions.” Maya helps organize many of Glitter’s events which attract people ranging from 19 to 35 years with widely divergent backgrounds and orientations — from Conservadox to secular, alienated to committed, Queer to Straight, and with the categories not always mutually exclusive. Like Kehilla broadly, Maya finds her Judaism in pursuing social and economic justice and “agitating for social action.” She thinks of Glitter Kehilla as a vehicle for fostering community as well as justice and “fabulocity”. Maya, age 26, takes it step by step. “I was very resistant to to giving up my proud badge of being an unaffiliated Jew,” she says, noting that she only officially became a member of Kehilla late this May. She also is an organizer. She can’t count the number of events she helped to put on. Glitter’s seder held this year at Kehilla drew 60. A core group of about 30 attend many events. For those who tend to political involvement, there’s the Jeremiah Fellowship with Bend the Arc, or Jewish Voice for Peace, Maya notes. Glitter Kehilla tends more toward the spiritual, but as with the umbrella Kehilla community, spirituality is commonly mixed with activism. “For me, being radically Jewish involves a commitment to Jewish values that goes beyond ‘we’re doing this because of l’dor va dor. … I think of Jewish values as my impetus to action, pushing me to do the right thing, take the right course of action and move toward tikkun olam.” Maya thinks of three great Jews as sources of inspiration — Jonas Salk, Abraham Joshua Heschel, and Emma Goldman. Maya grew up in Santa Cruz in a Reform congregation. Her mother, though not Jewish, has a progressive religious streak and works in education policy in Oakland. Her father lives in Santa Cruz where he teaches middle school. The extended family is very Jewishly involved. Maya attended Evergreen State College in Olympia, Washington. 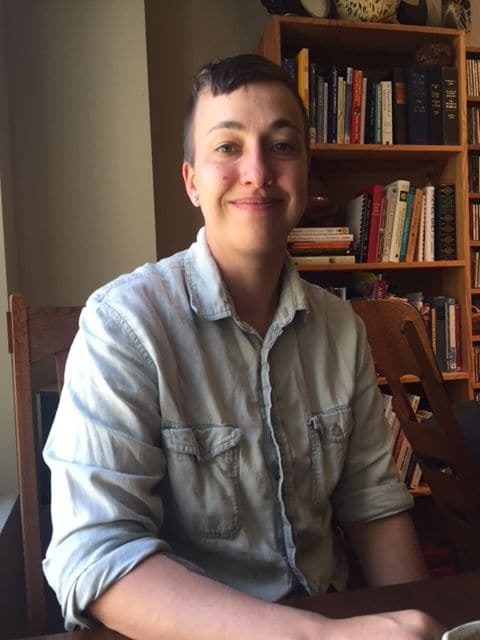 She moved to the East Bay with her partner five years ago, taking a job as a LBGTQ community organizer with the San Francisco office of Keshet for three years. She went on to further study at Mills to get her teaching credential and now is busy applying for jobs, planning to teach high school history. Meanwhile, she focuses on making Kehilla to be a radically welcoming and engaging place for her peers.